With these characteristics, we can see that the rapping voice can be compared to a monophonic (that is, single-voiced) instrument. Thus, we can see what drums do that the rapping voice might pick up on. I will then make suggestions about how to up the ante in the creation of rap, in order to take it even higher as an art form. First, I believe the use of cross rhythms (such as that by Nas in our prior analysis) is one area into which rap must grow. When you consider the rhythms of rap verses, it cannot be denied: most of them are very similar (mostly due to a lack of talent on the particular rapper’s part). There are only so many things one can do with a rhythm in 4/4 (as almost all rap songs are) when one is constrained (as rap is) by having verbal meaning. That is, a lot of rhythms are off limits to rappers (or so they seem) because their art is a combination of speaking and singing (singing implying more rhythm here, rather than pitch). That is, they must use fairly small rhythmic values, because when speaking normally people generally do not take large time pauses in between words. What I mean here is that rapping is constrained by the syntax of language (syntax is defined as the rules for the formation of grammatical sentences in a language.) Taking pauses in between syntactical groups can either be used for poetic effect, but to overuse this technique (known as enjambment) would be rather awkward. For instance, consider the sentence: “The brown fox chased the lazy dog.” If we parse this very quickly, we can see that “the brown fox” is the noun, “chased” is the verb, and “the lazy dog” is the direct object. To pause at a place in the sentence that upsets the syntax, such as by saying “The brown fox chased the-“, is awkward if it is done repeatedly. But the net result of all this restraint of rhythm is that unimaginative artists make the rhythms of their raps very uninteresting, as 4/4 is already a time signature which can quickly fall into monotony (due to its over-abundance of symmetry: 4 beats with a note value that divides by 4 as well. Remember all that tyranny of 4 from the Nas analysis?) However, cross rhythms would break this up. One creates cross rhythms by accenting metrical places in the bar that do not coincide with the metrical accents of the 4/4 musical bar on the 4 beats in the bar. (My Analysis of a Nas verse) This is a result of rapping in cells of notes that are not a multiple of 2, such as 3 (as Nas does), 5, 6, 7, etc. The fact that Nas was able to do this without any formal musical training is quite amazing. Along the same lines of rhythm, more and different time signatures need to be introduced. There are, indeed, instances of raps in 3/4 (Kanye West’s “Spaceship”, from his debut album “College Dropout”), 12/8 (Mike Posner’s first mix-tape version of “Cooler Than Me” has Big Sean rapping in triplets over a beat in 4/4, which could be notated in 12/8), 6/8 (I think it’s Nas’ “Heaven”), as well as double time (when the snare hits on the 3rd beat of the 4/4 bar, making the music sound twice as slow.) However, this time signatures need to be used more and more to break up the monotony of 4/4. From these examples listed above, one can see that it can be done, and done quite well. Notice that in all 6 bars quoted here, Eminem rarely does the same thing on a beat twice. (Here, we are comparing beat 1 in bar 1 to all the beat 1s of the rest of the bars, the beat 2 in bar 1 to the rest of the bars’ beat 2s, and so on.) For instance, on beat 1, Eminem does (in order) a sextuplet, a quintuplet, a quartuplet, back to a quartuplet (but with a different rhythm from the quartuplet before), back to a sextuplet (still a different rhythm from the sextuplet before), and then back to a quintuplet (once again, a different rhythm from the quintuplet that came before.) **As a quick review, a quartuplet here is fitting 4 sixteenth notes to a beat, a quintuplet fits 5 sixteenth notes to a beat, and a sextuplet fits 6 sixteenth notes to the beat. ** If that’s still all a little too much for you, just know the following: Eminem does something pretty much different on every beat throughout all 6 bars, allowing the phrase to anchor the listener’s ear while doing new things elsewhere. It’s so much more refreshing, and if you were to consider the two raps as purely musical phenomena (that is, without their verbal meaning), “What’s The Difference” really jumps off the page at you as clearly more interesting and skilled than Eminem’s 8 bars that we analyzed in “Business”. So I urge rappers: use phrasing, but don’t overdo it. Use it as an anchor that actually gives you freedom to move around and do interesting and unexpected things surrounding those phrases. My analysis of Game’s first verse from “How We Do” would be exemplary for this kind of expansion of the role phrases can play in rap music. A short introduction is needed for the following conversation, however. Musical development is when a music-maker starts with a musical idea (that is usually small and simple, but “catchy” for lack of a better word), and changes it throughout the musical piece, while always having it be identifiable as coming from that initial musical idea (sometimes called a motif or theme.) However, because rap is constrained by the reality of verbal communication (that it is a constant rhythm with short rhythmic values, as discussed before), traditional ways of development (such as rhythmic augmentation – the doubling of rhythmic values, or diminution – the halving of rhythmic values, along with others) are very hard to pull off. However, phrases solve this problem. Consider Game’s verse. This idea can be understood through the following mental exercise: if you were to divide the Game verse in half, 8 bars and 8 bars, each half of the verse as a musical idea would be considered incomplete. That is, the listener would not have had the full experience of the music. They would miss out on Game’s switching the syncopation on the 2nd sixteenth note of the beat in the first half of the 8 to being directly on the beat in the second 8 bars, which generates the central musical tension of the verse. However, the same cannot be said of Eminem’s verse from “What’s The Difference.” As good as it is, one can halve the verse in half, and each half is (for the most part) a complete musical idea. This is because Eminem generates the forward progress of his rap by simply moving from one musical idea dwelling on it, moving to another, dwelling there, moving to another, and so on. This idea of phrasal development (the switching between syncopation and strong on-beat accent, as simple as it is) that Game employs is quite effective, and should be considered another huge area of expansion for rap. Other changes I would make if I were to rap would be to undermine the tyranny of 4, as Nas does. If you need lessons on how to do that, you need only check out the Nas analysis I did. He created cross-rhythms in his flow, started phrases at structural points in the verse that were not multiples of 4, and also varied the length of his phrases. 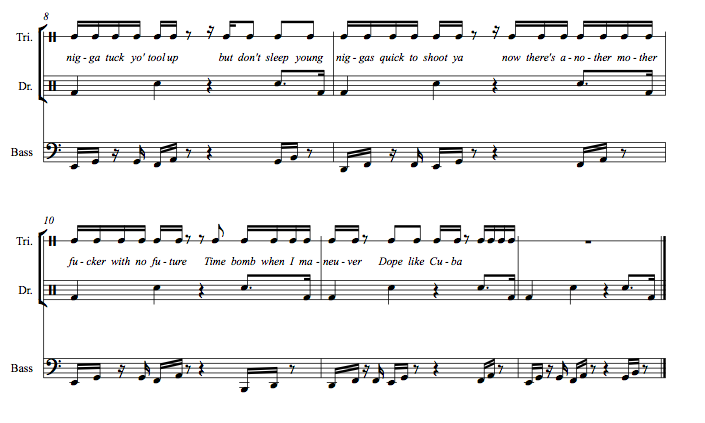 From a quick first glance, the sheet music very clearly outlines the following fact: the rapper’s voice, the drum beat, and the bass ALL skip the 3rd beat. Check for yourself: there are rests right on the 3rd beat in all of the bars. However, the wedding between the musical material of the beat and the musical material of the rapper are even closer than that. The characteristic musical idea in the beat (“beat” here referring to the drums + the bass guitar) is the note that occurs on the 2nd sixteenth note of the beat. In bar 1, for instance, that would be the F during beat 1, the G during beat 2, and in bar 2, the G during beat 1, and the A during beat 2. This quick, syncopated feel is reflected in the music of the rapper. Observe, in the 3rd beat, on the words “feet up”: you can see that same idea from the base, the syncopated 2nd sixteenth note, being played. In this instance, occurring on the 2nd beat in the bar, the rhythm of the rap lines up exactly with the bass. This continues on for some time: bar 4 (“grew up”), bar 5 (“threw up”), bar 7 (“school up”), bar 8 (“tool up”), bar 9 (“shoot ya”), and bar 10 (“fu – ture”). This combination in the rapping voice of skipping the 3rd beat and accenting that syncopated, 2-note sixteenth note idea, makes the drum, the bass, and the rapping voice all very closely related. This kind of textural unity is typical in classical music, and leaves the music more organized and sounding less like a combination of unrelated ideas all thrown on top of each other. I believe rap could benefit greatly from more effort to do things like this. I. Intro – 14 bars – 6 bars of a single note repeated, followed by the first appearance of the 8 bar piano theme that will appear over and over. II. Interlude 1 – 8 bars, starting at bar 15 – the piano theme with the beat and background instrumentation added. X. Verse 2 – 16 bars, starting at bar 79, by Pusha T – “24/7, 365… I’m just young, rich and tasteless.” – Note that the string theme that appears in the background for the final 8 bars of Pusha T’s verse is repeated later on, in the 2nd interlude. regular structure of a rap song that keeps the ear interested. The piano theme, which will appear over and over, is introduced in a solo setting. Coming after this is an 8 bar section that supplements a repetition of the piano theme with the entrance of the drums and background instrumentation. This is followed by the start of the main structure of the song not with a verse, as many songs do, but with a pre-chorus/chorus combo. This is followed by Kanye’s verse 1, and another pre-chorus/chorus combo. However, after the 2nd chorus, Kanye does not go to another verse, but rather introduces an 8 bar post-chorus section. This post-chorus is a riff on the verbal themes of the chorus, while Kanye sings a melody that is related but not exactly the same as the chorus. This is another innovation. After this post-chorus, Kanye does something that has been done before but not often: he places 2 verses back to back. The first is the verse 2 of Pusha T, which is 16 bars, which contrasts with Kanye’s verse 3, which is only 8 bars long. 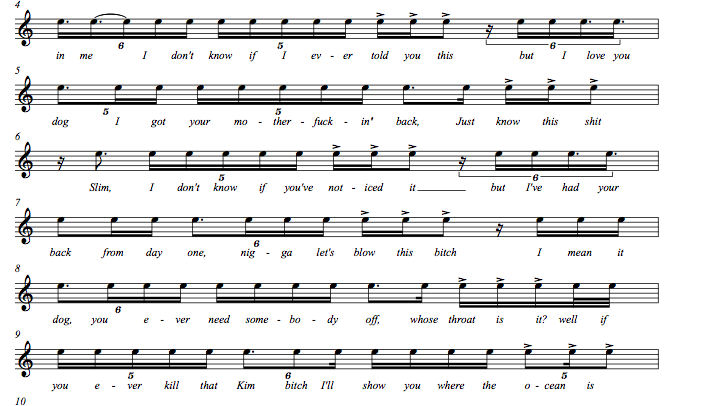 This is followed by the 3rd and final pre-chorus/chorus combo. At bar 119, there is a 2nd interlude of 8 bars, which sets the string idea that appeared in the 2nd 8 bars of Pusha T’s verse laid over the piano theme. This is an introduction of new material to further generate interest. This is followed by another section of the piano theme appearing solo, reminding the listener of how the song started. This comes before bar 135, which is where the hardly-seen-before innovation comes. The distorted instrument you hear is (I believe) a distorted, auto-tuned voice where the words are fuzzed out by all of the heavy distortion. I’m pretty sure it’s Kanye singing; and I know it’s a voice because you can hear at certain points the voice say “I think it’s time for us to have a toast.” This 64 bar section that closes the song is riffing off of the chorus melody, by having the same melody while the voice hits different chordal notes up and down the octave. What is most interesting to me here, however, is the 8 bar string theme that acts as a countermelody to the piano theme. While the piano theme consists of all on-the-beat notes (falling on bar 2 and bar 4 as it does), the string plays off its heavy on-beat accents by being very syncopated. The strings thus accentuate the effect of the piano theme and thus can be considered a countermelody. This is something that I have never seen before in a rap song. It displays a very sophisticated level of musical knowledge. All of these tiny changes in the structure, combined with the innovation of the 64 bar section, all add up to a very unique song structure. Simply count how many different sections can be counted: 16. And even if you consider the pre-chorus/chorus combo to be 1 section, you still have over 10 sections. This innovation is not limited to “Runaway.” Another good example is “Devil In A New Dress.” He starts off with verse/chorus/verse/chorus, but then switches things up from the usual path of a rap song. He inserts a guitar track that elaborates on the main musical idea from the first half of the song. This is very refreshing and new. Ask yourself the question: why are there almost NEVER any instrument solos in rap songs? They’re musically interesting (if they’re pulled off with some talent) and break up the monotony of the pop song structure. Then, after this unexpected bridge, he goes into a 3rd verse (by Rick Ross.) So although he starts it off like most songs do, in the 2nd half of the song he changes things up considerably. Finally, to close the song out, there is no chorus, but rather the guitar from the bridge comes back and ends the song in the outro. Overall, it’s very unexpected, but sounds awesome. As a final quick example, even when doing something regular, Kanye adds a twist. For instance, in the song “Gorgeous”, Raekwon’s verse is not backed up by the same beat as the other verses, but instead is rendered new by a completely new instrumentation and drums. More of these kind of things need to be done to raise the bar for rap. Now, let’s see what happens when you divorce the words from the rhythm of the rap. Tap out to yourself the rhythm of the notes of “I’m the enigma, there is none, HARDER, SMARTER, MARTYR…” paying special attention to how the three capitalized words sound, but especially how the notes of that last word, martyr, now sound without the verbal accent on that first syllable “mar-“, which is a result of how the word is naturally said. All of the musical meaning is lost, because you know longer have that strong verbal accent (of the syllable “mar-“) divorced from the strong metrical accent (if you’re a little lost here, go check out the pertinent section of the Nas analysis that I did.) Instead, with no verbal accent, the flow comes across as flat, and ending way too soon (and a little inexplicably) with a pick-up note that ends its idea on that 4th beat. It seems as if the rap stops there with no good reason. But if you put the verse’s words back in, then you feel that divorce between the verbal accent and the metrical accent, which supplies the musical action here. Now we have fully followed through on the implications of our comparison of the rapping voice to an instrument. As I’ve mentioned already multiple times, the next post will be a rap music analysis of a specific verse again (Eminem’s verse from Dr. Dre’s “What’s The Difference”, off Dre’s album “2001”.) I hope you enjoyed it! Keep Doing Your Thing With Your Blogs!! BTW Nas' dad was a working Jazz musician.